You probably heard terms like graphic design, product design or even fashion design. Why not just call them designer? Let me try to explain the different types of design roles. The design world is always changing as technology and innovation continues to evolve. Every day, new products and services are created that require the assistance of design. This constant change can make it are to identify every relevant design area. The word design itself is a pretty broad term that can be applied to a wield range of fields - from magazine editorial to car development-, thus creating a equally large amount of types of design jobs and/or roles. A designer’s role is usually defined by what they create, however every design job share a common goal: being at service of people and develop innovative products and/or services experiences that improve the quality of the client. Although the definition shifts from time to time, contemporary product design is defined by the process of making shippable physical or digital products. It’s about problem-solving and creating usable products and experiences, it’s about visualizing the needs of the user and develop a possible solution where details matter. The product designer goes through an analytical process and relies on a problem-solving approach to improve the quality of life of the end user. They create meaningful products and experiences capable of solving problems. Product design can be applied to many different fields, and the designer usually works with other professionals when developing a product. While a product designer is not necessarily in charge of the mechanical and technological aspects of a product, they focus however on the experience. They are in a constant loop of analyzing, designing, testing, launching, monitoring, and improving. The product design and engineering of the single-speed bike Speed ONE is a good example of product design. Graphic Design is a form communication that leverages visual elements to convey ideas. It has become an umbrella term that covers various types of design work, from logos to brochures to packaging, and so much more. A graphic designer uses typography, color, shapes, and images to bring a concept, idea or message to life. They use visually-appealing elements to create attractive designs that can be applied in multiples areas, like marketing, advertising and even production. A well designed graphic material is able to catch the attention of a certain audience and entice them to buy or use a certain product/service. Because of this, graphic designer is one of the most in-demand professionals out there in the market. A graphic designer has the ability to know how to talk to the client through a visually-appealing medium that combines both technical and artistic skills. An interaction designer is someone that creates a wide range of web interfaces, from blog templates and simple landing pages to fully-functional responsive websites and mobile applications. User Experience (UX): A UX designer is responsible for creating user experiences by designing every interaction between the user and the digital product. With User Testing, the designer The designer analyses and evaluates the experience that the customer has when using a certain site or app, and makes sure this experience it’s not just difficult or confusing but it also able to cater to all of the client’s needs. While analyzing a specific experience, the UX designer focuses on these seven factors: usability, usefulness, value, credibility, desirability, findability, and accessibility. User Interface (UI): A UI designer focuses on how people navigate through a site or an app using elements such as buttons and menus. Essentially, the designer creates an interface using certain features and functions on a web product for the user to interact with. A UI designer not only designs the graphics but also defines how users interact with those graphics. A motion graphics designer is responsible for bringing movement to otherwise static graphic elements like images or text. The world of motions graphics involves a variety of work from animated presentations to product demos to movie title sequences. Motion graphics is sometimes confused with animation, however the two are quite different in terms of what each one wants to tell. 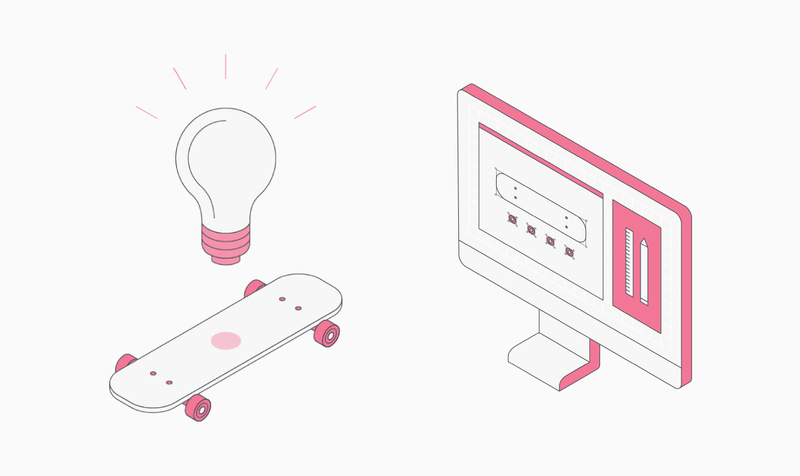 While animation is the visual representation of a story, motion graphics gives life to something that is usually static. The filmmakers at Splæsh are using motion graphics in most of their films to better tell stories with impact. Industrial designers develop every kind of product conceivable for a wide variety of purposes. They typically specialize in one type of product design, with their work being used in multiple manufacturing industries (i.e. city bicycles, automotive, lounge chairs or housewares…). While considering its function and form, a industrial designer uses prototypes, tests and iterates any product from idea to life. The industrial design process part of the single-speed bike Speed ONE is to ensure manufacturability of the initial concept.